Dr. Grace McComsey has been involved in HIV research for 16 years, 12 of those as an NIH-funded principal investigator. Her work has focused on the investigations on lipodystrophy and metabolic complications in HIV. Her work was paramount in showing the link between nucleoside inhibitor-induced mitochondrial toxicity and lipoatrophy in infected people. Her work was recognized by the HIV Medical Association of the Infectious Diseases Society of America, with the HIVMA Leader in HIV Research Award. Specifically in recognition for her work in advancing our understanding of lipodystrophy. She has personally led a number of studies, including several multi-center investigating different means to prevent and treat fat alterations in HIV, including uridine supplements, rosiglitazone, statins, and modulation of antiviral therapy dose and type. 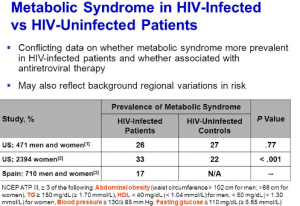 She has also led several SDG studies showing that central fat accumulation continues to be a major problem threatening the success of current HIV treatment. We’re going to talk about that today. That’s our focus. In the last 12 years, she has led Case HIV Metabolic Center, which is recognized for clinical and translational studies highlighting the pathogenesis and management of metabolic and cardiovascular complications in HIV. Over the last few years, she has been focusing on elucidating the role of inflammation and immune activation related to co-morbidities in HIV.